Valarie H. McPherson is a special immigration counsel in the Immigration & Nationality Group, with more than a decade of experience. She represents companies from Fortune 500 to small and medium-sized entities in the banking, finance, pharmaceutical, medical, publishing, manufacturing and fashion industries, as well as public and private foundations and individuals in a variety of immigration matters. 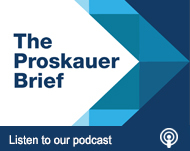 As a senior member of the Immigration practice at Proskauer, Valarie counsels large clients and handles some of the most complex and challenging matters, including E visa registration for new enterprises at the U.S. Consulates. She has been recognized by the New Jersey Law Journal as one of the top “40 under 40” lawyers in New Jersey and as a “Rising Star” by New Jersey Super Lawyers. Immigration Fact and Fiction for the U.S. Employer: CBP Searching Electronic Devices – A New Thing? Summer Slow Down: For the first time in memory, the quota reserved for the most desired immigrant applicants retrogresses for natives of India and China!